The Early Childhood Hearing Outreach (ECHO) Initiative is part of the National Center for Hearing Assessment and Management at Utah State University. The ECHO Initiative focuses on extending the benefit of periodic hearing screening to children 0 – 5 years of age in a variety of health and education settings. 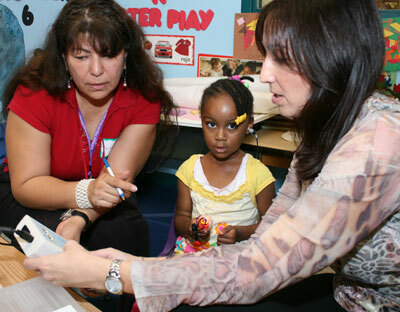 We also serve Early Head Start programs as the National Resource Center on Early Hearing Detection and Intervention. An array of resources for planning and implementing OAE or Pure Tone screening and follow-up practices including training/instructional materials. Tools for identifying a local pediatric audiologist to assist with training and technical assistance. An audiologist-approved OAE or Pure Tone screening and follow-up protocol. Guidelines and resources for selecting appropriate OAE equipment. Forms for documenting screening outcomes. Tools for tracking follow-up activities. Periodic webinars (including introductory and advanced information). Monthly electronic newsletter, Probes & Tips, offering helpful tips for implementing OAE screening and follow-up practices. The ECHO Initiative is providing technical assistance and training to establish evidence-based hearing screening practices in Early Head Start and Head Start settings across the country. These collaborations include assistance to planning for evidence-based practice, accessing training, and monitoring for quality implementation of recommended screening and follow-up practices. The ECHO Initiative is also collaborating with Part C Early Intervention Programs and providers in public and private health care settings in the development of OAE screening and follow-up practices that can potentially serve a broad early childhood population. The ECHO Initiative encourages all individuals and programs engaging in OAE screening to collaborate with their state’s Early Hearing Detection and Intervention (EHDI) or newborn hearing screening program, local audiologists and other state and regional offices devoted to relevant interagency collaboration such as Head Start State Collaboration Offices, State Head Start Associations, Primary Care Associations, and Early Intervention Coordinating Councils. To make contact with programs already engaged in implementing evidence-based hearing screening practices and/or trainers in your state, please contact us and include your state and city and what your learning needs are. The ECHO Initiative is funded in part by the Administration for Children and Families, the Office of Head Start, and the Maternal and Child Health Bureau under a cooperative agreement (U52MC04391) to the National Center for Hearing Assessment and Management at Utah State University. In addition, we would like to recognize the many early childhood education and health care providers across the country who have contributed significantly to the success of this effort.